Baruch Barzel & Albert-László Barabási, Network link prediction by global silencing of indirect correlations, Nature Biotechnology 31(8), 2013, p 720–725. doi:10.1038/nbt.2601. Soheil Feizi, Daniel Marbach, Muriel Médard & Manolis Kellis, Network deconvolution as a general method to distinguish direct dependencies in networks, Nature Biotechnology 31(8), 2013, p 726–733. doi:10.1038/nbt.2635. This post is the first of a trilogy (part2, part3) in which my student Nicolas Bray and I tell the story of these papers and why we took the time to read them and critique them. In order to quantify connectivity in biological networks, Barzel and Biham proposed an experimental perturbation model in the paper Baruch Barzel & Ofer Biham, Quantifying the connectivity of a network: The network correlation function method, Phys. Rev. E 80, 046104 (2009) that forms the basis for network link prediction in Barzel-Barabási. In the context of biology, link prediction refers to the problem of identifying functional links between genes from data that may be confounded by indirect effects. For example, if gene A inhibits the expression of gene B, and also gene B inhibits the expression of gene C, then if the expression of A increases, it will decrease the expression of B, which in turn increase C. Therefore one might observe correlation in the expression levels of gene A and C, even though there is no direct interaction between them. The Barzel-Biham model is based on perturbation experiments. Assuming that a system of genes is in equilibrium, it is a model for the change in expression of one gene in response to a small perturbation in another. The assertion of intractability is based on the claim that the equations are coupled. They reason that since the naïve matrix inversion algorithm requires operations for m equations, the solution of (3) would require time . When we looked at this system, our first thought was that while it is large, it is also structured. We sat down and started examining it by writing down the equations for a simple case: a matrix S for a graph on 3 nodes. We immediately noticed the equations decoupled into n systems of n equations where system i is given by and , with the n unknowns . This immediately reduces the complexity to , or even by simple parallelization. In other words, the system is trivially tractable. Here the operator “/” denotes element-wise division, a simple operation to execute, so that inferring S from G requires no more than inverting G and scaling it, a formula that is also much simpler and more efficient to compute than (2). [Added 2/23: Jordan Ellenberg pointed out the obvious fact that off the diagonal means that for some diagonal matrix , and therefore and since the diagonal entries of must be zero it follows that . In other words, the Sherman-Morrison formula is not even needed]. While it would be nice for us to claim that our managing to quickly supersede the main result of a paper published in Nature Biotechnology was due to some sort of genius, in fact the entire exercise would be suitable for an undergraduate linear algebra homework problem. Barabási likes to compare himself to the great physicist and nobel laureate Subrahmanyan Chandrasekhar, but it is difficult to imagine the great Chandrasekhar having similar difficulties. Unlike Barzel & Barabási that resorted to simulating with Michaelis-Menten dynamics in their study of performance of their approximation, using (4) we can efficiently simulate data directly from the model. One issue with Michaelis-Menten dynamics is that they make more sense for enzymatic networks as opposed to regulatory networks (for more on this see Karlebach, G. & Shamir, R. Modelling and analysis of gene regulatory networks, Nat Rev Mol Cell Biol 9, 770–780 (2008)), but in any case performance on such dynamics is hardly a validation of (2) since its mixing apples and oranges. So what happens when one simulates data from the Barzel-Biham model and then tries to recover the parameters? A comparison of the standard method of regularized partial correlations with exact inference for the Barzel-Biham model. Random sparse graphs were generated according to the Erdös-Renyi graph model G(5000,p) where p was varied to assess performance at different graph densities (shown on x-axis) The y-axis shows the average AUROC obtained from 75 random trials at each density. When examining simulations from the Barzel-Biham model with graphs on 5,000 nodes (see Figure above), we were surprised to discover that when adding even small amounts of noise, the exact algorithm (4) failed to recover the local response matrix from G (we also analyzed the approximation (3) and observed that it always resulted in performance inferior to (4), and that 5% of the time the correlation with the exact solution was negative). This sensitivity to noise is due to the term in the exact formula which becomes problematic if the diagonal entries of are close to zero. Some intuition for the behavior of may be gained from noting that if S is such that its geometric sum converges, the diagonal of is equal to that of . If S has mixed signs and there is significant feedback within the network, the diagonal of may be close to zero and any noise in the measurement of G could create very large fluctuations in the inferred S. This means that the results in Figure 1 are not dependent on the graph model chosen (Erdös-Renyi) and will occur for any reasonable model of gene regulatory networks including the modeling of both enhancers and repressors. From Figure 2a in their paper, it appears that Barzel and Barabási used in their simulation an S with only positive entries that would preclude such effects. Such an assumption is biologically unrealistic. However, the difficulties with noise for the Barzel-Biham model go much deeper. While a constant signal-to-noise ratio, as assumed by Barzel and Barabasi, is a commonly used model for errors in experiments, it is important to remember that there is no experiment for directly measuring the elements of G. Obtaining from an experiment is done by making a small perturbation of size e to gene i, observing the change in gene j, and then dividing that change by e. This last step increases the noise on the estimate of by a factor of 1/e (a large number, for a perturbative experiment) above the noise already present in the measurements. Increasing e acts to remove the system from the perturbative regime and thereby increases the intrinsic error in estimating G. It is therefore the case that attaining reasonable error on G will require very low noise in the original measurements. In this case of biological networks this would mean performing many replicates of the experiments. However, as Barzel & Barabási acknowledge in their paper, even a single replicate of a perturbation experiment is not currently feasible. While the exact algorithm (4) for inverting the Barzel-Biham model performs poorly, we found that a widely used shrinkage method based on partial correlation (Schäfer, J. & Strimmer, K. A Shrinkage Approach to Large-Scale Covariance Matrix Estimation and Implications for Functional Genomics, Statistical Applications in Genetics and Molecular Biology 4, (2005)) outperforms the exact algorithm (blue curve in Figure above). This suggests that there is no input for which (4) might be useful. The method is not even ideal for inference from data generated by the model it is based on. The three methods tested potential improvements on are Pearson, Spearman and Mutual Information. Pearson and Spearman rank 16/35 and 18/35 respectively in the DREAM5 benchmarks. 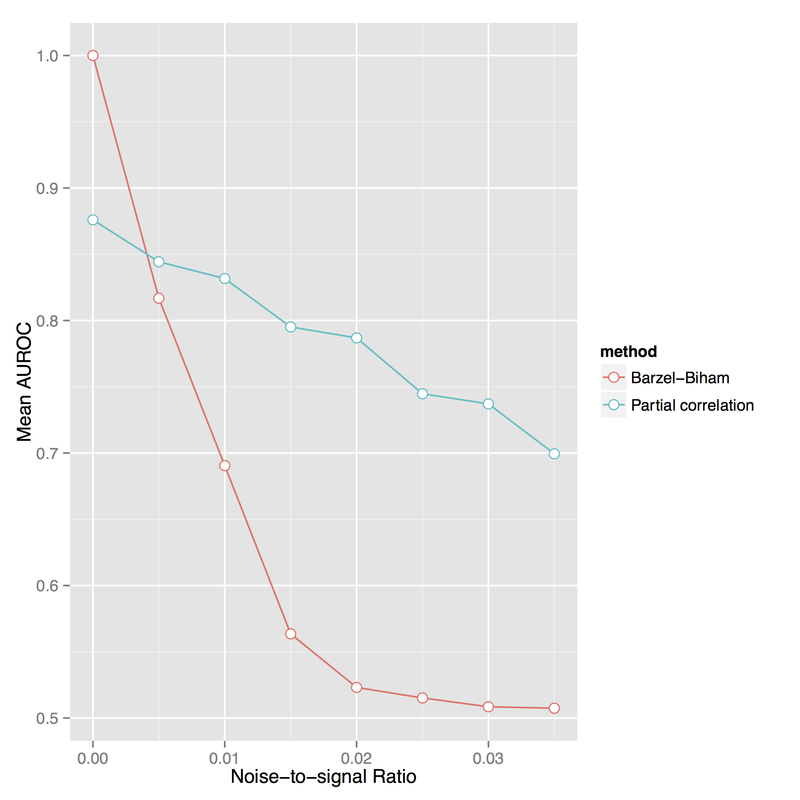 There may be some reason why Silencer applied on top of these methods improves performance: in the case where G is a correlation matrix, the path interpretation given by Barzel and Barabási connects the inference procedure to Seawall Wright’s path coefficients (ca. 1920), which in turn suggests an interpretation in terms of partial correlation. However in the case of mutual information, a method that is ranked 19/35 in the DREAM5 benchmarks, there is no statistically significant improvement at all. The improvement is from an AUROC of 0.67 to 0.68. Amazingly, Barzel and Barabási characterize these results by remarking that they “improve upon the top-performing inference methods” (emphasis on top is ours). Considering that the best of these rank 16/35 the use of the word “top” seems, shall we say, unconventional. We have to ask: how did Barzel & Barabási get to publish a paper in the journal Nature Biotechnology on regulatory network inference without improvement or testing on anything but a handful of mediocre DREAM5 methods from a single dataset? To put the Barzel-Barabási results in context, it is worth considering the standards the Feizi et al. paper were held to. In that paper the authors compared their method to DREAM5 data as well, except they tested on all 3 datasets and 9 methods (and even on a community based method). We think its fair to conclude that significantly more testing would have to be done to argue that Silencer improves on existing methods for biological network inference. We therefore don’t see any current practical utility for the Barzel-Biham model, except possibly for perturbation experiments in small sub-networks. Even then, we don’t believe it is practical to perform the number of experiments that would be necessary to overcome signal to noise problems. Unfortunately the problems in Barzel-Barabási spill over into a follow up article published by the duo: Barzel, Baruch, and Albert-László Barabási, “Universality in Network Dynamics.” Nature Physics 9 (2013). In the paper they assume that the local response matrix S has entries that are all positive, i.e. they do not allow for inhibitory interactions. Such a restriction immediately renders the results of the paper, if they are to be believed, moot in terms of biological significance. Moreover, the restrictions on S appear to be imposed in order to provide approximations to G that are unnecessary in light of (5). Given these immediate issues, we suspect that were we to read the Universality paper carefully, it is quite likely this post would have to be lengthened considerably. Barabasi is famous for the “BA model”, proposed in Barabási and Albert ‘Emergence of Scaling in Random Networks“, Science, Vol. 286 15 October 1999, pp. 509-512. Lada Adamic and Bernardo Huberman immediately refuted the practical applications of the model. Moreover, as pointed out by Willinger, Alderson and Doyle, while it is true that scale-free networks exhibit some interesting mathematical properties (specifically they are resilient to random attack yet vulnerable to worst-case), even the math was not done by Barabási but by the combinatorialists Bollobás and Riordan. Barabási has has repeatedly claimed metabolic networks as prime examples of scale-free networks, starting with the paper Jeong et al., “The large-scale organization of metabolic networks“, Nature 407 (2000). This fact has been disputed and refuted in the paper Scale Rich Metabolic Networks by Reiko Tanaka. The issue of attack tolerance was the focus of Error and attack tolerance of complex networks by Réka Albert, Hawoong Jeong & Albert-László Barabási in Nature 406 (2000). John Doyle refuted the paper completely in this paper. In the paper “The origin of bursts and heavy tails in human dynamics” published in Nature 435 (2005) Barabási pretends to offer insights into the “bursty nature of human behavior” (by analyzing e-mail). In a follow up comment Daniel Stouffer, Dean Malmgren and Luis Amaral demonstrate that the reported power-law distributions are solely an artifact of the analysis of the empirical data and the proposed model is not representative of e-mail communication patterns. Venturing into the field of control theory, the paper “Controllability of complex networks” by Liu, Slotine and Barabási, Nature 473 (2011) argues that “sparse inhomogeneous networks, which emerge in many real complex systems, are the most difficult to control, but that dense and homogeneous networks can be controlled using a few driver nodes.” Not so. In a beautiful and strong rebuttal, Carl Bergstrom and colleagues show that a single control input applied to the power dominating set is all that is required for structural controllability of most, if not all networks. I have also blogged about this particular paper previously, explaining the Bergstrom result and why it reveals the Barabási paper to be a control theory embarrassment. In other words, Barabási’s “work” is a regular feature in the journals Nature and Science despite the fact that many eminent scientists keep demonstrating that the network emperor has no clothes. Post scriptum. After their paper was published, Barzel and Barabási issued a press release claiming that “their research moves the team a step closer in its quest to under­stand, pre­dict, and con­trol human disease.” The advertisment seems like an excellent candidate for Michael Eisen’s pressies. The Bollobás, Riordan paper is a beautiful example of coupling graphs. They show that within every preferential attachment graph there is a large sparse random graph and each PA graph has a large part contained inside a sparse random graph. You won’t see any such insight into the underlying random structure in B’s papers. Critical discussions are good. It’s a shame that “leading” journals do not publish critique, replications (including when things do not replicate) and papers pointing to methodological errors. Given the lack of appropriate forum it is good you publish critique on your blog. Did you ask the authors to take a look and defend themselves? From a wider perspective, how come everybody knows that the leading science journals are full of bad science and still everybody want to publish there? As long as we all believe that everybody wants to publish there, we will all want to publish there, right? To answer your question, we submitted a truncated version of this blog post to Nature Biotechnology almost 5 months ago. The two page comment has not yet been decided on by the journal, and my understanding is that a major reason has been the delay of Barzel and Barabási in responding to it. So they did get a chance to respond, but to be honest we just gave up on waiting. Its still possible that Nature Biotechnology will publish our comment and their response. I don’t know, and I don’t particularly care at this point. The authors are of course welcome to post replies in this comments section. Can you post this two page comment, like you did for Manolis Kellis’ paper, or is that the same comment? We have a separate comment for this paper and it is still under review at Nature Biotechnology. It follows the post closely, and I plan to post it in the near future. Thank you for an excellent read. I had myself struggled a lot with the issue of noise when trying their approach in R, and rapidly concluded that the method was simply not usable for any of the biological networks and correlation networks I was interested in. It is astonishing that a method so overly sensitive to noise and multicollinearity is being sold as applicable to biological data. See also, http://www.ncbi.nlm.nih.gov/pubmed/15496552 our modest contribution to this controversial / trendy subject, years ago. I found the ALB paper very misleading in terms of their claimed contributions. The paper looks pretty but the content is very hollow, not to mention there are technical issues. I showed the paper to one of the students, and he quickly spotted the derivation was nonsense. The journal should clarify why this paper is accepted. 1. I really really hate Lior’s blogs, because the three blogs cost me two weeks to understand the major viewpoints. Lior’s great match really scared me. So I have to improve my math for a better understanding, and have to discuss with my friends. 2. Great thanks to write the blogs. My friends and I truly respect you, and what you are doing. Everybody clearly know that you will get no profit from doing so, but you did. You are a great man and a real computational biologists. Sorry that I wrote the blogs in Chinese, but I tried my best to keep the major viewpoints of Lior. So Chinese scientists can take a look on it, if you do not want to read English. I will apologize if some misunderstandings were made, because it’s too difficult to me for the math. It looks like the overhype is quite common in academic society. I am offen stranged that some really poor work can be published in top journals, but noboday dare to stand out. So, the Bioinformatics field should thank for Lior’s criticisms, which is much, much, much helpful for the current and future of the field. I am afraid you had made a mistake in your Chinese blog, especially the first one. The scaling parameter is for the eigenvalue but not for the sequence as you explained. You should give a careful read of Lior’s new blog post https://liorpachter.wordpress.com/2014/02/18/number-deconvolution/ for details. You are not the first person to notice that ALB papers were mostly BS. Same with the Medard and Kellis paper. In fact, the entire literature is full of these kinds of BS. The problem is that people do research to get grants and not the other way around. But you are the first that had the “balls” to openly announce these findings. I do not have the same amount of courage as you do (and I commend you on that). But the cottage industry that Barbasi fathered has spun so much out of control that it is unstoppable. This guy should become an NAS and NAE member! He markets his junk quite well. BTW, comparing oneself to Chandrasekar should be done with care since Edmund Stoner had scooped (and did a more thorough calculation) Chandrasekar but did not get the notoriety for some “reason”. Moreover, Chandrasekar it note cite Stoner, even though the evidence is that he knew about the earlier work. So, why stop at NAS/NAE….go straight to Stockholm! Typo…I meant Chandrasekar DID NOT cite Stoner…. I’m so glad I came across your post today and find out about Barabási’s history of nonsense papers. He published two closely related papers in Science (http://www.sciencemag.org/content/327/5968/1018) and Nature (http://www.nature.com/nature/journal/v484/n7392/full/nature10856.html#close) on migration and mobility. I am a population geographer and migration researcher and wondered why I could not make sense of a paper published in a prestigious journal. The findings don’t look plausible at all to me, and the model cannot be replicated because the data haven’t been made available…. Anyway, now I know what to think of it. Took the liberty of posting this on hacker news, apologies if this is not appropriate. The comments are of some interest. Delighted to see that I am not the only one who is annoyed by this Barabasi rubbish. This (and the followup postings) are very much appreciated. I observed the nonsense of Barabasi many times in the past. What puzzles me, however, is that many researchers feel the need to cite his papers. (A quick look at Google shows 22886 citations.) There is a certain “we have to” feeling. People feel they must (for some religious reason?) cite the paper. Recently, I reviewed a paper for a journal with solid mathematical content. They cited the infamous Barabasi-Albert paper stating that they observed a limit result. I told the authors that I took a close look at this paper and found it utterly trivial, with no mathematical content, containing lots of jargon (and, at best, some computer simulations) and, in fact, even the model was not new when the paper was published (1995): the model was known in 1955; see Simon (1955), Biometrica Vol. 42, pp. 425-440. Ok. almost complete mathematical ignoramus here, but still a teacher, 5th grade. I picked up Linked at B & N. Like science. Opened to pg 98. Bose Einstein condensation. Why here in networks? Read, read, fine, then Pg. 101: !!! Bianconi discovery of incredible similarity of fitness model nodes in networks to energy levels in Bose gas…gosh…suddenly they have done the extraordinary and blended at last the quantum and Newtonian worlds and I’ve heard nothing of it? “…each node in the network corresponds to an energy level in the Bose gas.” All those gas particles at almost 0 Kelvin sink to lowest energy level, new form of matter, and that has what to do with macro world networks and fitness? The rich get richer because the cold all sink down thru energy levels? Help? Keep thinking of similies-apples and toenails or some such. Remembering P. T. Barnum. Elementary school teacher only, me, but afraid I can’t buy this one. Beating Einstein….maybe not this time. Tear me apart, but I really don’t get it. Welcome any explanations-that aren’t too mathematical! Dear Lior, I find your tone quite rude here. Admittedly, I do not understand your maths discussions; the only thing I can say is that ALB’s network of diseases is highly predictive and inspirational. We are working on an exciting sub-cluster of this, which appears to prove everything true about this new definition of diseases and drug repositioning. I am current a Graduate student in New York and I have been following your blog for a long time. In a recent assignment for a course that I am taking, Critical Dissection of Scientific Data, I choose to take up this paper by Barabasi and have read through this blog again. Here is some thoughts I would like to share. 3. With regard to the broader work of Barabasi, professor John Doyle (disclaimer: I am a big fan of him) has claimed in his dropbox video lecture (https://www.dropbox.com/sh/7bgwzqsl7ycxhie/AACL0TVRi5H0k9-r63T1hIyva/VideosSlidesPapers/2.0.OverviewWithNeuroEmphasis?dl=0, ZombiSciIntro) that biological network is in fact, not scale-free, as oppose to what Barabasi has claimed. However it was not clear to me what the explanation is in the video and I can’t find a proper citation yet. Finally, as long as I am here, I want to thank you for writing these blogs. As a graduate student, I was appalled how Dr. Eric Lander (or someone who claims to be him) reacts to your p-value prize blog and it is now clear to me (after some mental gymnastic) that they were claiming something trivial as significant. So your blog has been a positive impact on my academic life and I believe it is important to read your blog in a sometimes somewhat unfortunate academic environment. Thanks for your comments and for the links- much appreciated. John Doyle is passionate about the problems of network analysis and has written a lot in the area so I’m not sure which paper is most relevant to the claims in the talk. I know he is still interested in the topic- you should ask him. The underlying issue arises when the original authors assume that the average of the function is the function at the average for explicitly nonlinear maps. This is indeed only true for linear maps. The embarrassing fact is that Barabasi got over 100,000 citations to his papers so far. Neither me, nor the authors of this funny contribution equal him in this respect. So, why not throwing mud at him, just for the sake of our ego? The authors’ arguments are partly mathematical in nature. I have nothing to add here. However, I note that there are far more people who refuted Darwin’ evolutionary theory than those who refuted the claims and models of Barabasi. Some maintain that the Earth is flat. Whatever people refute, evolution is the best we can do with the information we have, and the Earth is certainly round. I consider this article a psychological means of addressing threats to the ego. If one cannot grow up to somebody one has to bring him or her down. Nice trial. (Ps. I am not Barabasi. I am just a biologist newly acquainted with his work, and I was fascinated). Thanks for your interesting and courageous blog! I’m a high energy physicist trying to follow the literature on network theory and stumbled across this page. Regarding point 1. of your summary: I had been pretty stumped on how the BA model from ‘Emergence of Scaling in Random Networks’ could have been quite as innovative as it was promoted to be. I recommend the great review article by Newman https://arxiv.org/abs/cond-mat/0303516v1 specifically section VII where he explains in simple terms how the BA model is a special case of the 1965 citation-network model by Price, which curiously is never cited in the BA paper nor their reviews. I have no horse in this race but the lack of proper accreditation to the Price model by BA made it super confusing for me in trying get a grip on this vast literature. I’m not aware of any other scenario in physics where authors have gotten so much kudos for a “result” which is so clearly a sub-case of a previously published article (Newman points out that both the Price and BA articles were published in Science 🙂 ). As for the complaint that BA were not mathematically precise…I am very supportive of articles being published before being made rigorous, I don’t see any great crime by BA in that regard. The lack of credit given to Price is however really bizarro. Albert Lazlo Barabasi, a professor of network science at Northeastern University is in New York Times. « Why do you look at the speck in your sister’s quilt plot and pay no attention to the plank in your own heat map?